I first tasted gai pad gra pow this past spring (late pass, I know), when my friend Natasha offered me a bite of her dish at a Thai restaurant in San Francisco. I was hooked, and I had to learn how to cook it. 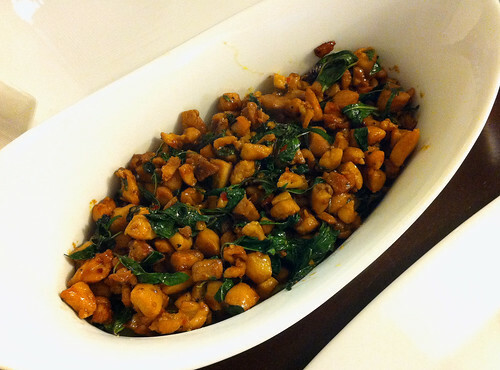 Since then, this basil-inflected chicken stir-fry has become one of my favorites. Spicy and full of protein, it pairs perfectly with a cooling cucumber salad and steamed rice. 1. Place a wok over high heat. Add the oil, garlic, and chiles and stir-fry for 30 seconds, or until the garlic is slightly golden. Add the chicken and stir-fry for 5 minutes, or until the chicken has cooked throughout, using a spatula to press the meat against the hot wok. 2. Add the fish sauce, soy sauce, sugar, and pepper and stir-fry for 1 minute. Add the basil and stir-fry until wilted, about 1 minute, then turn out onto a serving dish. Serve warm.